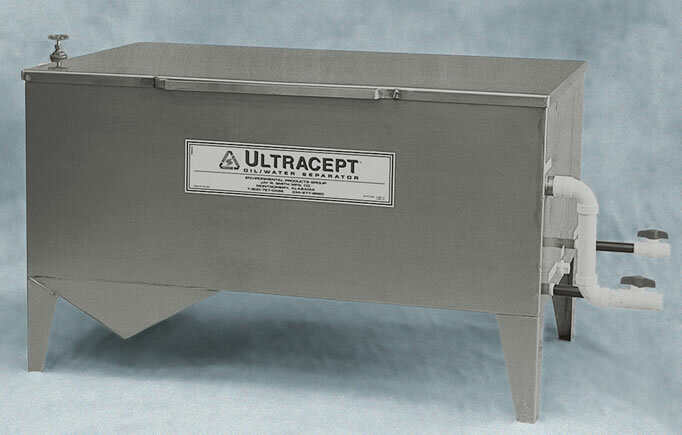 Ultracept® Water Cohesive Oil/Water Separator 8602, 8605 - Interceptors - Jay R. Smith MFG Co. The Ultracept® series separators are used in applications where water quality discharge requirements are the most stringent. The proprietary Ultracept Oil Water Separator design provides separation efficiency without the need for coalescing packs, filters or chemicals. Used in service garages, industrial plants and most cleaning applications where oil and sediment must be efficiently removed to very low (PPM) discharge levels. The continuous skimming design of the unit uses water to skim even the slightest sheens of oil from the surface of the water. The skimmed oil is carried to a off-line compartment where it is easily removed during periodic maintenance. Solids that are collected are discharges through a sludge draw-off valve in the rear of the unit. The separator requires no electrical power to operate; it saves energy and protects the environment by removing oil concentrations at less than 10ppm. Modular Unit, Flow Control Valve. All Required Plumbing Components, Sch. 40 PVC.